On September 28, 2009, it was announced that the Put-in-Bay Township Park District was awarded a NatureWorks grant in the amount of $17,948. This completed the 25% matching funds required for the Clean Ohio Conservation Fund Grant awarded for the project in 2008. 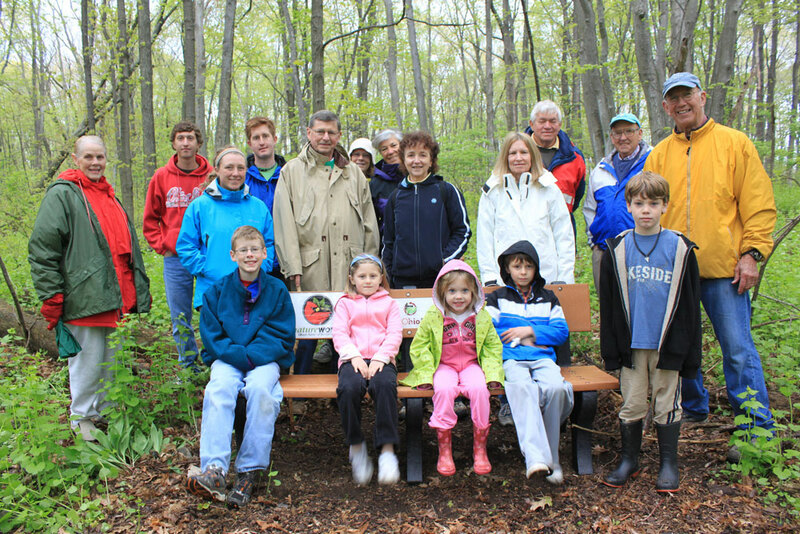 A commemorative bench was placed to the south of the trail addition area on Earth Day 2010 with a dedication ceremony. The bench can be enjoyed from the north side of the trail. The following donors of $1,000 or more to the LEIC or the Park District are named on the bench: Clean Ohio Conservation Fund, NatureWorks, Vacationland Aerie # 444 Inc., Fraternal Order of Eagles from Sandusky, First Energy Foundation, Thomas and Mary Katzenmeyer, Frost-Parker Foundation, and Randolph J. and Estelle M. Dorn Foundation. This is another two acres of wildflowers and woods for all to enjoy. Thanks to all who made this project possible. 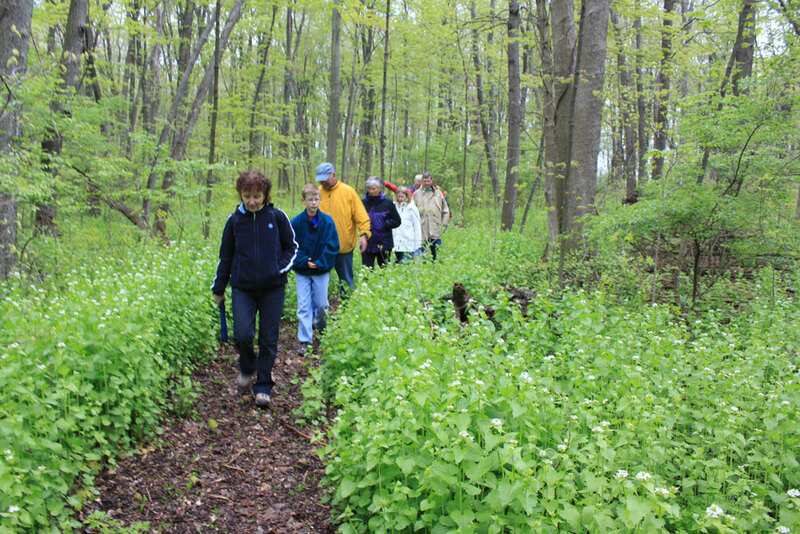 Funds from a private donor and a Clean Ohio Conservation Fund grant in November 2007 allowed the Lake Erie Islands Conservancy to purchase three acres of woods adjacent to the Ladd Carr Wildlife Woods. The Jane Coates Wildflower Trail links the two properties. The Conservancy thanks land owners John and Debbie Woischke and Nettie La Plante for their cooperation and patience through the grant and acquisition process. Mrs. La Plante’s late husband, Harvey, always enjoyed the woods around their home and often enjoyed walking through them. “We are so pleased the LEIC has purchased a portion of the woods so that it won’t be developed,” Mrs. LaPlante said. John Woischke also enjoys walking in the woods and is always puttering on his wooded property. He said he also is happy to see a portion kept as woods. 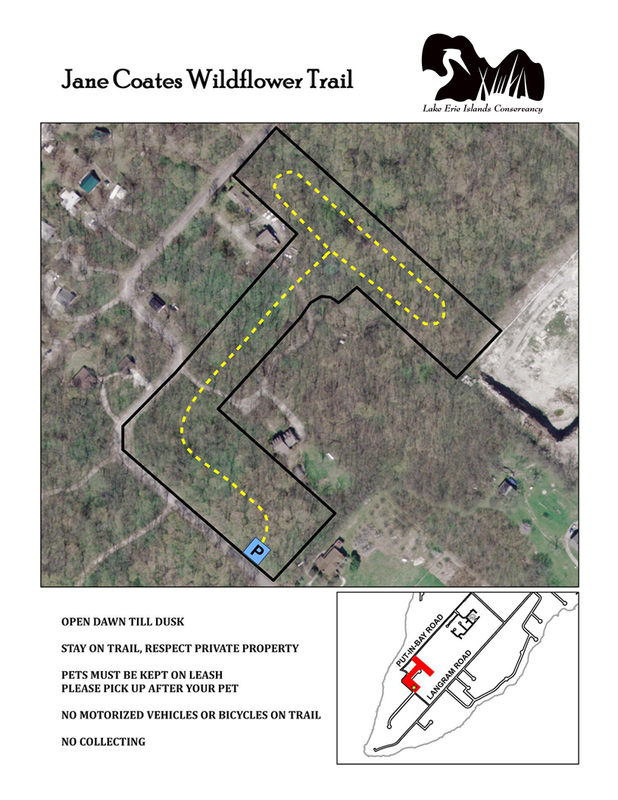 The Trail area is wooded with a mix of Sugar Maple, Blue Ash, Basswood, Black Cherry, and Common Hackberry. Wildflowers like Dutchman’s Breeches, Jack in the Pulpit and Blue Phlox are present in the spring. It is a great place to watch birds, enjoy wildlife, and walk in the woods. Jane Coates, a well known former island artist, was well known for her love of the island and especially its wild areas. See a Trail Bird List in our Fauna section. View and download trail map here. Become a Member of the Lake Erie Islands Conservancy to protect and preserve island lands for future generations. Lake Erie Islands Conservancy is a 501c3 nonprofit organization. Your contributions and membership fees are tax deductible. Make a one time donation in any amount. Everything helps our cause. Thank you. Download PDF form. Print and mail your contribution by check. It will be very much appreciated! Download latest bird watching list. Enjoy and learn about the great variety of birds who make the Lake Erie Islands home. Read or download the latest edition of the LEIC Newsletters.